Tocal Field Days are held every year at Tocal Agricultural College Paterson beginning on the first Friday in May. This is one of the big entries on our social calendar. During the week before we note down the exhibitors or products that we would like to see. Some years we attend on the Friday and other years on the Saturday just depending on what competitive activities are in play. Friday is less crowded but some exhibitors may not have setup as they have businesses to operate elsewhere. Saturday is really busy but everything is in full swing. There are always a few bargains such as the Seasol man who always offers a good deal for bulk buys. More so on Saturday and even more so on Sunday. This is our opportunity to pick up a 20 litre drum for a good price. Jean likes to see the working Kelpies and the chicken displays as well as the plant nurseries. There are always a few exhibitors with some exotic plants that raise interest. Last year we picked up a Wasabi plant which is still going although not as well as it should be. Although the chickens a wonderful to see they are horrendously expensive but we can dream. The working Kelpies are a pleasure to observe. You know those reed thin dogs that run all day and have big grins. I usually have a few small tools I'd like to acquire and look forward to the huge cheap tool stands. I've come to realise that although there are usually 3 or 4 tool stands only one is any good when it comes to price. The others are always a couple of dollars dearer. And one seems to have the best collection of rusty metal probably because it is all exposed to the weather. The big disappointment this year was the plastic wheelbarrow trays. There were none. 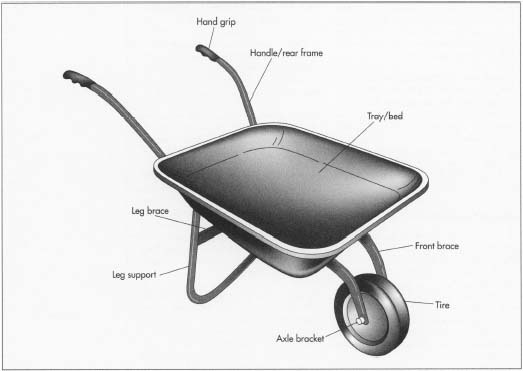 We have two wheel barrows with failing trays which will need replacement in the next 12 months and our acquisition of the replacement part was planned for this Tocal day. Last year when there were plenty it was too early and now I'm too late - bugger. Just as well we have four wheelbarrows. This is a socialising day as well. Despite the crowds we bump into many friends and acquaintances as we wander about the exhibits. A brief chat only as both parties are keen to continue with the main objective. There are hundreds of exhibitors and it takes a few hours to get around even when we have targeted interests. We have brought along a thermos of coffee and take a break midway for a reviving drink and scone. Lunch never eventuates even though it is packed in the esky. Just too busy to bother going back to the car a second time. On the way home we talk about what was missing among the exhibits and what was exciting and then over a reviving cup of tea at how we exam our acquisitions with pleasure.